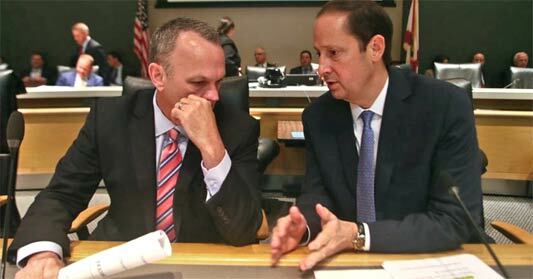 It brought Senate President Joe Negron into sharp focus, since he seems to be the one leading the charge to turn the quid pro quo reached in secret last week with Speaker Richard Corcoran and Gov. Rick Scott into a quid pro no. It makes for dandy political theater and all, but shouldn’t all of this have been worked out BEFORE the three amigos appeared on stage together last Friday to tout the budget agreement? The way it was presented made it sound like everyone had gotten something they wanted and all the other lawmakers had to do was see the brilliance of the compromise and pull out their rubber stamp. Let’s try to make at least a little sense out of this, shall we? Simply put, the way education will be funded in Florida appears to be at the center of this knockdown, drag-out. Negron’s main interest appears to be increasing money for the state university system. He has long championed an effort to bring Florida’s institutions of higher learning into the same status as, say, those in Michigan and Virginia. That’s not surprising. Negron is an educated man, holding a master’s degree from Harvard and a law degree from Emory University. He apparently wants to restore money to the university system that would otherwise be redirected to the K-12 public system. Why he didn’t make that point during the now-infamous secret meeting last week with Scott and Corcoran isn’t clear. Then again, maybe he did and the other two weren’t paying attention. I’ll bet they’re paying attention now, though. For the acronym-challenged, EFI stands for Scott’s beloved Enterprise Florida jobs incentive program. Visit Florida is the tourism promotion arm. Corcoran used his opposition to both programs (CORPORATE WELFARE, he screamed) as a kind of Trojan horse so he could push forward with what appears to be his real agenda — an expansion of charter schools. With the possibility of a Scott veto looming over Corcoran’s signature piece of legislation, they thought they reached the compromise that was unveiled last Friday. Scott seemed satisfied with the funding for his programs, and Corcoran threw in a few requirements in the name of accountability about how the money will be spent. I guess they didn’t count on Negron’s last-minute gambit. There is no way to know how this is going to end or how long it will take, so I won’t hazard a guess. The last time I tried to do that, I got whiplash. I don’t want to make it any worse.